Two weeks ago Judith and I went away for 5 days to Barcelona. We had a great time enhanced by a week of blue skies, sunshine and 18 degrees Celsius. We did many things but only scratched the surface of this lovely city and will have to go back again.The Sagrada Familia Basilica,(see picture above) created by Gaudi is breath taking although not yet complete. It is a must to see. We had a 10 minute wait to get entrance tickets, having arrived by a tour bus. We had taken a two day ticket which gave us a circular route to the west and east with the facility to get off and on as we chose. This is something I would recommend as well worth doing to get your bearings but to choose a few things before you go that you want to see, when time is short. If you do go to the church be advised to go underneath to the crypt where there is an enormous display of Gaudi’s drawings and an explanation of his thinking. He was a great architect and artist, with a basic back to nature theme. We also went to the Picasso museum because he has a close connection with Barcelona. The museum is devoted to his life from early works right through his various periods. The real excitement for me came at the very end of the various rooms in the gallery. He was fascinated by Velázquez and his painting of the family of Felipe IV which is in the Prado museum in Madrid. The series of paintings that Picasso did, Las Meninas, is explained in a wide corridor by means of a video presentation, which superimposes his pictures on that of Velázquez. His numerous attempts are all there to see in the next gallery, once you have looked at the video. Be advised; don’t go into the gallery housing these paintings without seeing it. I now think I understand Picasso much more than I did previously and it has set me off thinking about a series with which I might experiment. Something I re-visited whilst there are the line drawings he did without taking his pen off the paper. It inspired me to try whilst having lunch in the old quarter of Barcelona. I also tried whilst waiting in the Airport. Since I have been back I have used the technique both in figure drawing. It’s quite a demanding drawing technique but makes you really look and think carefully. I have added my sketch book attempts here. And of course look at Picasso’s minimalist line drawings on the web or better still, go to Barcelona. While I have been to many local art exhibitions and seen some fabulous paintings, it had been playing on my mind recently that I really ought to visit one of the art galleries in London. This in mind, I booked a couple of train tickets for my wife and I earlier last month. The extraordinary thing about train travel is, though fairly expensive, if you can book your journey off peak, a month or so ahead, you travel for peanuts in comparison. Our tickets from Market Harborough to London cost £17 each – the same journey bought on the same day as travel would have been near £90 each! Although it was October, the weather proved outstanding, with a lovely warm sunny day where we were all walking around in our summer clothes, but unlike summer, it wasn’t too hot and we weren’t looking around for somewhere shady to be comfortable. The great thing about London is that there is so much to see, and like Paris, much of which on a grand scale. 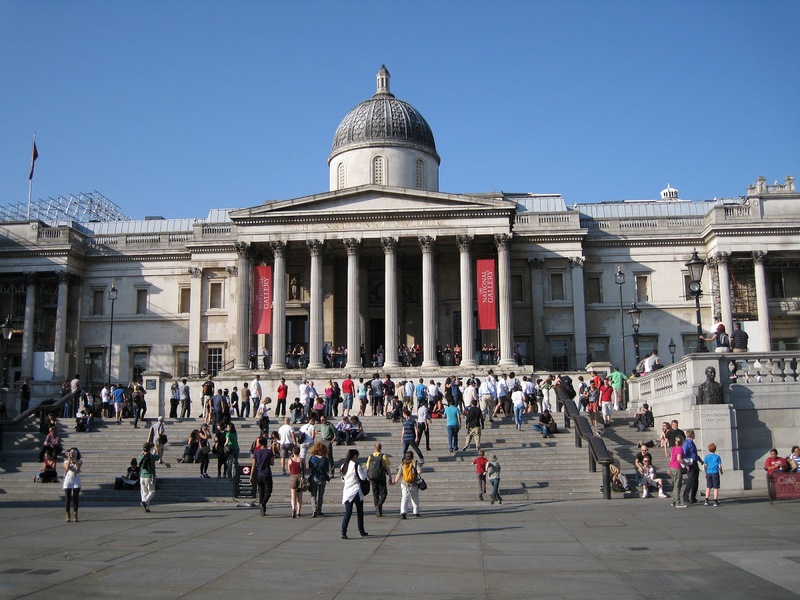 Our chosen venue was the National Gallery on Trafalgar Square, a huge building with the most impressive portico elevated from the north side of the Square. From this portico, the view across the Square was brilliant, dominated by Nelson’s column and those huge lions at the four corners of the statue, this set amongst the fountains, all rounded off nicely with Big Ben clock tower in the distance. I learned later that the National Gallery houses well over 2000 of some of the world’s greatest paintings! More amazing though is the fact that entry to view these marvellous works is absolutely FREE! Having said that though, there is a large donation box as you go in, and as soon as I stepped inside the first hall and saw the magnificence of the work that greeted me, I realised that the note I dropped into that box was the best value for money I’ve had for a long time! OK, I’ve seen some really old paintings at various historical houses we’ve visited over the years, but nothing could have prepared me for this. I was absolutely in awe of some of the works on display. So much so, that the amount of time it took me to take in various paintings left me way behind my wife in the viewing stakes! I was glad that we took advantage of the audio commentary, where we wore headphones, and just tapped in the painting number to hear the info on work and artist. Some of the paintings were incredibly large, some taking up almost entire walls in these halls, which in themselves are huge affairs with sky high ceilings! This in itself had dramatic impact, but even more so was to see work by the likes of Monet, Renoir, Degas etc. close up and REAL – the actual work right before my very eyes. It is difficult to describe the effect of seeing a well-known painting in front of you rather than in a book or on the computer screen – just amazing! A blogger friend of mine, Sandra, recently blogged of her visit to this place, where she was so taken by the works of Van Gogh. Well, I never got to see his work as it soon became very apparent to me that it would take considerably more than one day to see and appreciate everything on show in the National Gallery. I am very much a fan of Renoir, and I did get to see a number of his best known works, but the artist that I was so taken by was Canaletto. 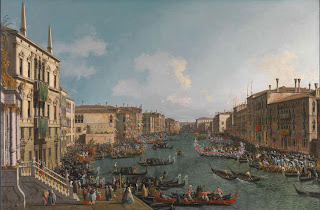 His huge works – vistas of Venice on a grand scale, were a marvel to behold indeed. 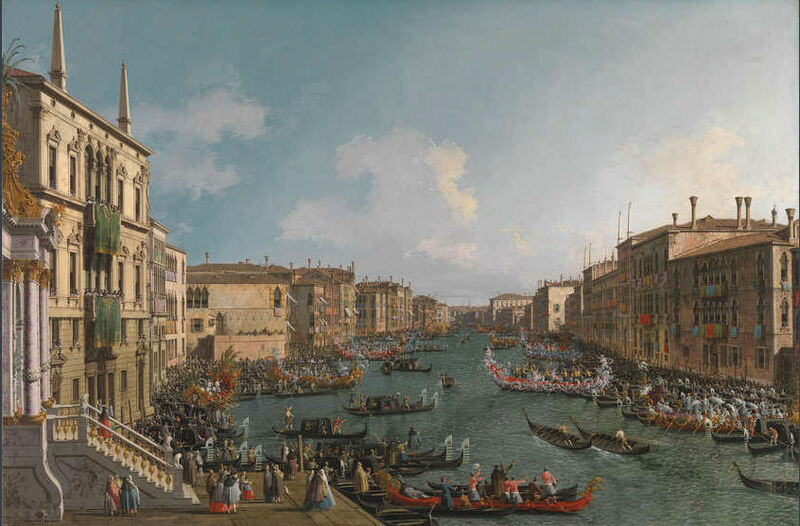 His portrayal of all the buildings, canals and hundreds of people throughout his works was astonishing, and in such detail too. It must have taken him months, no years to paint these scenes. Incredible! After we could no longer stand on our legs, a cup of coffee in one of the bars was a welcome respite. Here, there were lots of computer terminals where you could look up all the details and location of works on show. Again, free access – all the information readily to hand. Afterwards, there were the (inevitable) gift shops, where one couldn’t resist coming away with a little souvenir of our day at the National Gallery, London. Am I a Rubbish Artist? Well, another of our Annual Exhibitions has come and gone. I say another, but for me, this was the first time of displaying my work in this way. Unfortunately, like a number of us, I didn't sell any paintings. "It's not a very good economic climate just now" I've heard said, but wait a minute, one or two paintings did sell, so someone out there is buying. This leads me to believe that my work isn't good enough. That said, should I just accept that I am a mediocre artist? Should I lay down my brushes and take up gardening or something like that instead? Or, should this strengthen my resolve to practice more, experiment more and to swat up on techniques, subject matter, presentation etc.? Of course, it has to be the latter. I am not going to give up that easily! So, from today onwards, let me draw every day, paint whenever I can, read those painting books which are gathering dust on the shelf, study other artist's work (especially successful artists), resolve not to sit in front of the TV or computer so much and not loose sight of my goal - to be a better artist! If you look at Frank Bingley’s blog about painting,’ en plein air’ at Kibworth Post Mill you will realise what a great evening out for Club members it was. A little disappointing that only four of us turned up and one hopes for more next time. We were joined by two non-members that had read about the event on the website. The last time we met, in July, the demonstrator couldn’t come because there had been a sudden family problem for him. We were indebted to two visitors who rescued the evening by bringing a video by Tim Fisher. 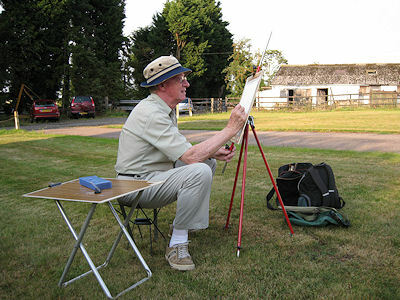 He was showing how to paint in the open air using coloured pencils, colour sticks and ink pens that bleed when touched with a water carrying brush. Since I had all of the equipment he was using I decided I would try his technique when painting at Kibworth Post Mill. I have added the painting here, still on my board, to show my effort in the two hours we had. And if you look carefully you can see Frank! The article that I have added here is one I wrote some time ago and which has stayed in my computer files. I came across it when changing computers and decided to send it to the letter page of the Artist Magazine. Imagine my delight when they e-mailed me to say they would publish it in the August edition. To my surprise it was the letter of the month! Today I received the prize of System 3 Heavy Body Acrylics, worth £34.95 courtesy of Daler-Rowney. The magazine had edited the original piece and I think it makes for a better read but you must judge for yourself. I wrote this when we lived in the West Midlands and we have now moved to Market Harborough in the East Midlands. The Black Country accent has been muted for clarity!. 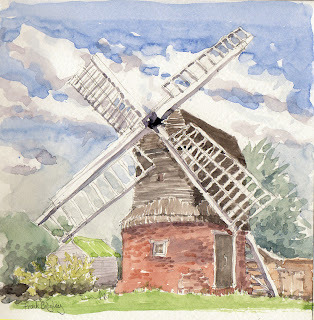 Earlier in June I went to paint the scene behind Stuart Crystal Cone where the canal and locks are to be found. Later at home I began the process of enlargement on a prepared board and laid down colour and tone in acrylic paint ready for the next stage. Two days later I returned with the work on the easel, my palette prepared, ready to begin working in oils. 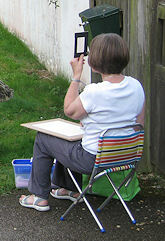 The wind, which tried to blow my easel over, was rippling the water and the reflection was but a blur. Just as I was putting out some liquin to help the drying process, a little boy with his fishing rod came by and stared at the work. I looked up in disbelief, dribbling sticky liquin down my trouser leg and, sure enough, it had been towed away. The lock gate mechanism began to whirr by my side. A wife was dutifully labouring whilst her husband sat patiently in the boat, waiting patiently to navigate out of the lock and into my picture, whilst churning up any reflections. At least they were too engrossed to worry about me. When a man with a dog arrived, I thought I knew what he was going to say. However he didn’t but stood and looked at my picture. Whilst trying to tell him that it was my course work for the Open College of the Arts and therefore not for sale, that I noticed his dog quietly peeing on the bag containing my paints and things! If you are painting in watercolours you can bet someone’s pet dog your water but this just about took the dog biscuit! I did visit again and finished the painting. Perhaps the next time I am out on my own I shall follow the advice of a professional artist friend. “The best thing to do is to put cap down by the side of you. If anyone ventures near you, ask for a contribution. It works wonders!” It’s a bit like having insect repellent when painting,’ en plein air’ or for the fleas when sketching new calves in a barn, but that leads me to another story. And this is the painting at the back of the cone Stourbridge.